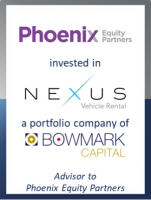 GCA Altium acted as exclusive M&A and debt advisor to Phoenix Equity Partners on its investment in Nexus Vehicle Rental, in a transaction that values Nexus at £142m. Nexus is the leading technology platform for B2B vehicle rental in the UK and this marks the 24th technology transaction led by GCA in 2018. This is the second transaction GCA Altium has completed with Nexus in recent months (following the December 2017 refinancing) and further extends GCA’s leadership in the mobility technology space, with other notable transactions including the sale of Urban Engines to Google and the investment in Radius Payment Solutions by Inflexion. Nexus connects corporate customers with vehicle rental companies through its proprietary online booking and rental management system, IRIS. The system provides Nexus’s 1,000 corporate customers with access to over 550,000 vehicles sourced from 220 rental companies across 2,000 locations. Nexus, which is based in Leeds, UK, was established in 1999 and has since achieved impressive growth through its highly differentiated service proposition, industry-leading technology and strong market position. The investment by Phoenix will allow Nexus to continue to increase its penetration of the corporate market and develop its technology platform. Phoenix has acquired a majority shareholding in the company and the transaction provides an exit for previous investor Bowmark Capital.